Like Bush, Obama will bequeath to his successor wars he failed to finish. Less remarked upon, he will also pass along to President Clinton or President Trump new wars that are his own handiwork. In Libya, Somalia, Yemen, and several other violence-wracked African nations, the Obama legacy is one of ever-deepening U.S. military involvement. The almost certain prospect of a further accumulation of briefly celebrated and quickly forgotten “milestones” beckons. During the Obama era, the tide of war has not receded. Instead, Washington finds itself drawn ever deeper into conflicts that, once begun, become interminable—wars for which the vaunted U.S. military has yet to devise a plausible solution. Once upon a time, during the brief, if heady, interval between the end of the Cold War and 9/11 when the United States ostensibly reigned supreme as the world’s “sole superpower,” Pentagon field manuals credited U.S. forces with the ability to achieve “quick, decisive victory—on and off the battlefield—anywhere in the world and under virtually any conditions.” Bold indeed (if not utterly delusional) would be the staff officer willing to pen such words today. To be sure, the United States military routinely demonstrates astonishing technical prowess—putting a pair of Hellfire missiles through the roof of the taxi in which Mansour was riding, for example. Yet if winning—that is, ending wars on conditions favorable to our side—offers the measure of merit by which to judge a nation’s military forces, then when put to the test ours have been found wanting. Not for lack of trying, of course. In their quest for a formula that might actually accomplish the mission, those charged with directing U.S. military efforts in the Greater Middle East have demonstrated notable flexibility. They have employed overwhelming force and “shock-and awe.” They have tried regime change (bumping off Saddam Hussein and Muammar Gaddafi, for example) and “decapitation” (assassinating Mansour and a host of other militant leaders, including Osama Bin Laden). They have invaded and occupied countries, even giving military-style nation-building a whirl. They have experimented with counterinsurgency and counterterrorism, peacekeeping and humanitarian intervention, retaliatory strikes and preventive war. They have operated overtly, covertly, and through proxies. They have equipped, trained, and advised—and when the beneficiaries of these exertions have folded in the face of the enemy, they have equipped, trained, and advised some more. They have converted American reservists into quasi-regulars, subject to repeated combat tours. In imitation of the corporate world, they have outsourced as well, handing over to profit-oriented “private security” firms functions traditionally performed by soldiers. In short, they have labored doggedly to translate American military power into desired political outcomes. The rules of engagement currently governing air operations in Afghanistan are, in their view, needlessly restrictive. Air power “represents an asymmetric Western advantage, relatively safe to apply, and very effective.” (The piece omits any mention of incidents such as the October 2015 destructionof a Doctors Without Borders hospital in the Afghan provincial capital of Kunduz by a U.S. Air Force gunship.) More ordnance will surely produce “some version of victory.” The path ahead is clear. “Simply waging the Afghanistan air-power campaign with the vigor we are employing in Iraq and Syria,” the authors write with easy assurance, should do the trick. Granted, Petraeus and O’Hanlon are on solid ground in noting that as the number of U.S. and NATO troops in Afghanistan has decreased, so, too, has the number of air strikes targeting the Taliban. Back when more allied boots were on the ground, more allied planes were, of course, overhead. And yet the 100,000 close-air-support sorties flown between 2011 and 2015—that’s more than one sortie per Taliban fighter—did not, alas, yield “some version of victory.” In short, we’ve already tried the Petraeus-O’Hanlon take-the-gloves-off approach to defeating the Taliban. It didn’t work. With the Afghanistan War’s 15th anniversary now just around the corner, to suggest that we can bomb our way to victory there is towering nonsense. Petraeus and O’Hanlon characterize Afghanistan as “the eastern bulwark in our broader Middle East fight.” Eastern sinkhole might be a more apt description. Note, by the way, that they have nothing useful to say about the “broader fight” to which they allude. Yet that broader fight—undertaken out of the conviction, still firmly in place today, that American military assertiveness can somehow repair the Greater Middle East—is far more deserving of attention than how to employ very expensive airplanes against insurgents armed with inexpensive Kalashnikovs. To be fair, in silently passing over the broader fight, Petraeus and O’Hanlon are hardly alone. On this subject no one has much to say—not other stalwarts of the onward-to-victory school, nor officials presently charged with formulating U.S. national security policy, nor members of the Washington commentariat eager to pontificate about almost anything. Worst of all, the subject is one on which each of the prospective candidates for the presidency is mum. From Secretary of Defense Ashton Carter and Chairman of the Joint Chiefs of Staff General Joseph Dunford on down to the lowliest blogger, opinions about how best to wage a particular campaign in that broader fight are readily available. Need a plan for rolling back the Islamic State? Glad you asked. Concerned about that new ISIS franchise in Libya? Got you covered. Boko Haram? Here’s what you need to know. Losing sleep over Al-Shabab? Take heart—big thinkers are on the case. Now almost totally forgotten, Khe Sanh was then a battlefield as well known to Americans as Fallujah was to become in our own day. Located in the northern part of South Vietnam, it was the site of a besieged and outnumbered Marine garrison, surrounded by two full enemy divisions. In the eyes of some observers, the outcome of the Vietnam War appeared to hinge on the ability of the Marines there to hold out—to avoid the fate that had befallen the French garrison at Dien Bien Phu slightly more than a decade earlier. For France, the fall of Dien Bien Phu had indeed spelled final defeat in Indochina. Was history about to repeat itself at Khe Sanh? As it turned out, no … and yes. 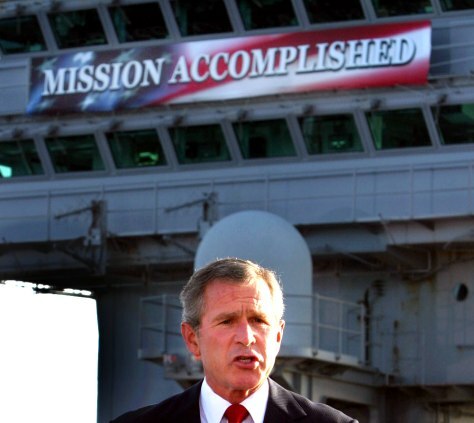 The Marines did hold—a milestone!—and the United States lost the war anyway. Today the United States finds itself in a comparable situation. What to do about the Taliban or ISIS is not a trivial question. Much the same can be said regarding the various other militant organizations with which U.S. forces are engaged in a variety of countries—many now failing states—across the Greater Middle East. Fine, Mr. President. Let it be trumpeted far and wide: “an important milestone”. Now how about keeping your solemn promise to get us the hell out of there? “…this unspoken assumption: if we kill enough people for a long enough period of time, the other side will eventually give in.” As COL Bacevich and many others know, that idea was tested along the jungle paths of the Ho Chi Minh trail and in the rubber plantations and tall grass plains of south Viet Nam and found to be true. The problem is that it was the Viet Cong and NVA that tested it and, sure enough, we eventually gave in. We killed many more of them than they did of us, but they were fighting at home, for home, while we were … well, I was there and to this day I’m not sure what we were doing. But we had a draft then and one result of that draft was enormous public pressure to quit. A deep shame of the current wars is that, because such a small fraction of our populace is involved, public outrage fades away, replaced by perhaps a bit more turnout for Memorial Day events, not much else. When O’Hanlon finally passes on to the great geopolitical ball field in the sky, I think the Smithsonian should get his corpse and put it in a special “Beltway culture” exhibit in the Anthropology hall of the Natural History Museum. Spectators can then learn how the Inuit and the Iroquois and the Anasazi had to cope with external reality, truth, to survive — but members of the Beltway Culture tribe could blunder and fail and lie over and over, and never suffer the tiniest inconvenience. The Taliban leader we killed, will only be replaced by another. Our political leaders are starting to remind me of Robert McNamara and Vietnam. “Kill ratios” and tons of ordnance delivered, etc. are attempts to measure that we are “winning.” You cannot kill an idea, an ideology with airstrikes. McNamara and Johnson did not grasp that the Vietnamese wanted a united and independent Vietnam and they did not care about how many troops they lost accomplishing it. Barry Goldwater nailed it when he described McNamara as the man who knew the price of everything and the value of nothing. I believe that this describes our current political leadership quite well. When a government pursues an announced agenda that isn’t working out, it is best to assume that the real agenda is something other than the announced agenda. Maybe the real agenda is to keep the Middle East in perpetual turmoil so the “nations” there do not form alliances with the Iran or China, choking off US access to oil. Afghanistan: still the graveyard of empires. But today, perpetual war is also an endlessly profitable revenue stream as per the corporate outsourcing and offshoring model.